I sometimes hear Catholics argue that the disunity of Protestant churches shows that Protestant churches are not part of the “one true Church”. After all, the true church isn’t divided. I’ve been thinking about the argument recently. I’m not sure how the argument works. Protestants know that the division of Christ’s body is a shame, and many Protestant leaders are working for unity. But does the division among Protestant churches show that they aren’t in the One True Church? If a church (or body of churches) is divided, then it is not part of the One True Church. All Protestant churches are divided. Therefore, no Protestant church is part of the One True Church. Before this argument is acceptable, we need to know what “divided” means. The argument turns on that. Let’s examine four possible meanings of “divided”. Before that, though, what would it take for a meaning of “divided” to make the argument work? First, the meaning of “divided” needs to make the argument work against Protestantism without allowing a similar argument to work against Catholicism. Second, we need a good reason to choose this meaning of “divided”. The people in the pews are divided in their beliefs. The different ethnic groups are divided. The leadership is divided in their beliefs. The authority structure is divided, so that it isn’t clear to the average person what church authority to follow. I’m know this list isn’t exhaustive, but it’s a start. Does one of these four possible meanings work? I do not think so, as I think that each of the four types of division are in the Catholic church as well as the Protestant church. It is obvious that Option 1 (people in the pews aren’t united in their beliefs) will not work. Catholics are as divided as Protestants. For example, “Catholics (55%) are as likely as the general population (57%) to believe that 14- to 16-year-olds should be able to access contraception, even if their parents do not approve. (GSS, 2008)”. This is just one of several statistics I could give showing that Catholics are divided on some crucial issues. So Option 1 doesn’t work. Option 3 (division between the leaders concerning doctrinal beliefs) doesn’t work either. 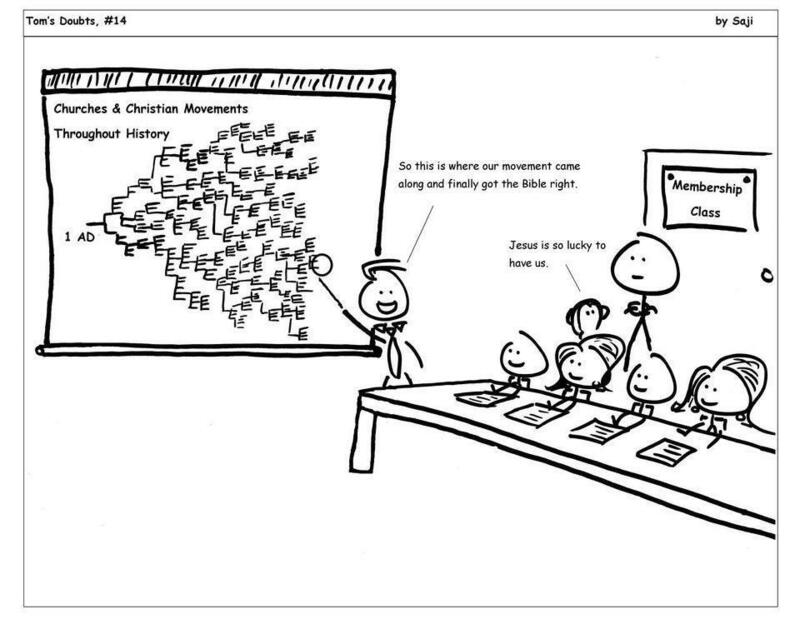 First, the authority structure of the NT church was divided at times. Paul’s statements in Galatians indicate that James (at that time) differed from Paul on how to deal with Gentile converts. Second, I did a 5 minute google search and found instances of Catholic bishops disagreeing with Vatican statements on religious matters. Third, priests are authority figures in their parishes, but there have been plenty of priests who oppose Vatican teachings. I’ve myself have met several. And, fourth, there are plenty of instances in the history of Christianity where the leaders of the church were sharply divided on doctrinal issues. So I don’t think we can use this meaning of “divided” without implicating the NT church, Catholicism, and the historical church. There have also been robber councils, which were illegitimate councils. How could the average person in the pew decide which of these divided authority structures was legitimate, especially when the Vatican still cannot discern which side was legitimate? (So much for the infallible Magisterium bringing clarity and certainty during these periods.) So Option 4 doesn’t work either. If none of the four options for the meaning of “divided” works, then I don’t know how to make the argument work. Maybe someone has a more rigorous form of the argument that Protestant disunity somehow shows that no Protestant group is a (or the) “true” church. But unless I find this argument, I won’t find this argument compelling.